'Swords of Sorrow' #4 feels like the narrative that's been laid out over the last three issues and the tie-in stories is finally coming together and moving forward full speed ahead. Some interesting revelations are revealed and the team of champions assembled by the mysterious Traveller are finally united with only two issues left in this sprawling crossover event. As anyone who's read giant crossover events like 'Swords of Sorrow' from comic book publishers knows it is a huge undertaking and hiccups are inevitable. Especially, when the cast of characters is so numerous some will get underdeveloped along the way. Despite the one-shots and miniseries that supplement this main series, the amount of familiarity with all these chosen warriors is a mixed bag. Sometimes having so many wonderful female characters can be too much of a good thing. 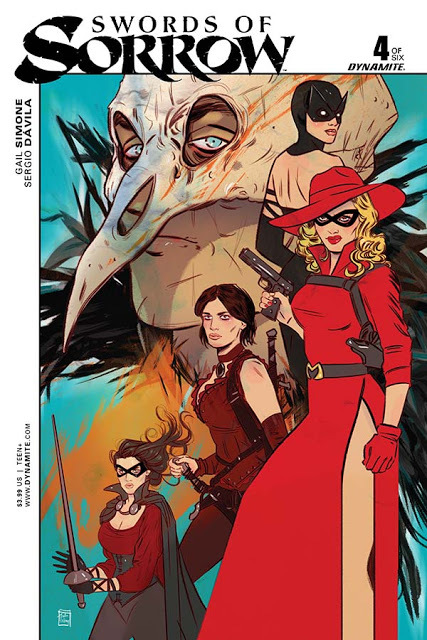 Having read the supplemental issues helped to get to know Irene Adler, Lady Zorro, Black Sparrow but didn't do so much for Jungle Girl, Eve, and Masquerade. So when they all appear together some lost into the background. This is a natural consequence of juggling so many personalities. With the negative stuff out of the way what remains is chockful of exciting action and plot movement that unfolds an epic showdown the size of an Avengers movie. The chosen women of The Traveller have to unite the 'Trinity' of Red Sonja, Dejah Thoris, and Vampirella. They're broken up into teams like their tie-in books and set off into a fast-paced montage. The Traveller decides she'll join the battle along with her band of fighters and reveals her history with the evil Prince. All these developments and a visit from Purgatori keep penciller Sergio Davila and colorist Jorge Sutil busy as they create fully rendered panels with rich detail and varied angles. Davila's work has only gotten better as the series has gone on with such care in the design and composition of each scene. There is so much going on in each page, especially with the number of characters, Davila does fluid and steady work. It's all infused with Sutil's restrained but deep palette of hues. 'Swords of Sorrow' #4 sets the table for the expected showdown against the Prince's forces by finally bringing together all the hand-picked warriors. The series is picking up steam as Gail Simone raises the tension and prepares readers for one wild finish to this fun and exciting event.